LCA is the official distance-learning provider for ACEM® and exclusively uses the Accelerated Christian Education curriculum for students in Levels K-12. LCA currently assists over 4,500 enrolled students from around the world. LCA serves as an extension of the Bible-believing Christian home and local church, working harmoniously with parents to achieve God’s purpose for their child. Students in private schools and homeschools earn an accredited diploma through LCA. The distance learning program gives flexibility to students and assists them in increasing their knowledge of God's universe. Using the Accelerated Christian Education program, LCA students discover how they can become independent learners in a non-classroom environment. Parents and students get assistance from LCA advisors as they navigate the curriculum and chart their academic course. On the surface, most schools look alike—buildings, personnel, curriculum, and budgets. The A.C.E. program is different. For over 45 years, it has been the trendsetter in Biblical educational reform. Its philosophy is built on basic principles of the Word of God. Students are taught to see life from God’s point of view, to take responsibility for their own learning, and to walk in Godly wisdom and character. 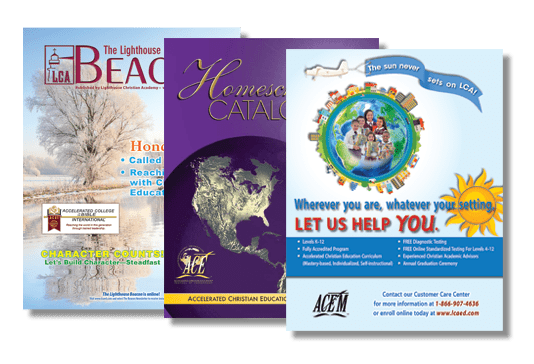 Accelerated Christian Education® is not just a publisher but a comprehensive Bible-based program that serves both the campus-based school and the homeschool. Lighthouse Christian Academy does not discriminate against members, applicants, students, and others on the basis of race, color, gender, or national or ethnic origin.